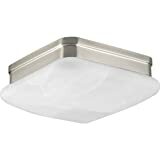 Richler Lighting 12664NI Shielded Face Horizontal LED Non-Dimmable Stoplight features a sleek, updated look in a modern Brushed Nickel finish and low-profile, unobtrusive design. 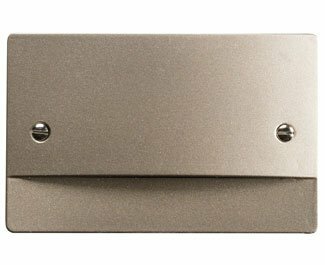 By illuminating a steep decline in a staircase, or any walkway or room, the simplicity of a step light can have a profound impact in a home or business for safety and assurance that will be appreciated for a lifetime. This fixture can be installed horizontally and fits neatly into a standard electric junction box. The 12664NI is 5IN wide x 3.25IN high and includes a highly energy efficient 1W 3000K integrated 40,000-hour LED module (not dimmable). LEDs are free of infra-red or ultra-violet rays, are cool to the touch and will not damage those special objects showcased under these lights. LED lamps provide 30,000 - 50,000+ hours of lamp life and perform virtually maintenance free for years. The result: 80% less electricity used, lower energy costs, easy maintenance and exquisite style. The 12664NI comes one per package. Since 1938, Richler Lighting has offered a distinctive array of lighting solutions that reflect your individual personality, tastes and plans. Richler brings you an unparalleled variety of exciting style families, unique finishes, fresh colors and unequaled quality. Whether it's casual, contemporary, transitional or traditional, you'll find it with Richler, lighting that defines your style.